HE WINDS ARE BLOWING THROUGH THE HALLS OF THE UNIVERSITY OF MANITOBA. Not the icy blasts of yet another snowstorm, nor, we hope, just hot air and rhetoric, but the winds of change. The university, and in particular the Faculty of Medicine, is in a period of reflection and reorganization. Some of the challenges faced in this process - curriculum reform, renegotiation of faculty contracts, the spectre of "downsizing" - are hardly unique to our institution. Others reflect more directly the nature of our university and its regional circumstances. Spearheaded by the province's Economic Innovation and Technology Council, strategic planning for health research in Manitoba has been ongoing for some time. Growing awareness of Manitoba's declining share of MRC funds and our failure to capitalize on new dollars available through PMAC and other University/ Industry programs made it clear that revitalization of health research in Manitoba was necessary. As a result of this initiative, an operational plan has been proposed for a Manitoba Health Research and Development Council to replace the current MHRC, and other recent developments have been encouraging. These include the establishment of the MRC Regional Partnerships Program; a provincial initiative to provide matching funds for infrastructure support, and the construction of the University Downtown Centre - a joint University and Foundations for Health venture designed to provide needed research space, as well as new library and recreational facilities. We have established a Steering Committee for the Regional Partnerships Program and begun the process of identifying current and emerging areas of strength and uniqueness. The committee is surveying the research community to document these areas and the criteria that individual researchers use to identify them. We anticipate that many emerging areas can be strengthened through this process and that new collaborations will be supported. However, there is already a strong foundation on which to build, and the successes of some of our well established research teams should be highlighted. 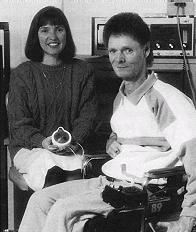 Dr. Patricia Nance (left), with patient Garry Ollson, shows the innovative baclofen pump which is part of a treatment technique developed by the Spinal Cord Research Centre to reduce muscle spasms of patients with spinal cord injuries or muscular diseases. 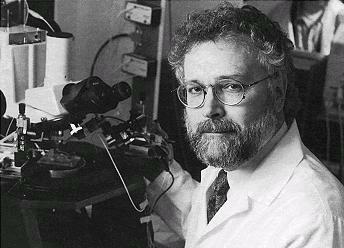 Directed by Dr. Larry Jordan, the Neurosciences Research Group, in the Faculty of Medicine and the Spinal Cord Research Centre of the Health Sciences Centres is funded by MRC and other agencies, including the Health Sciences Research Foundation. Its research interests are focused on two major functions affected by spinal cord injury or disease: locomotion and bladder control. The program includes projects aimed at characterizing the cells in the nervous system that control walking and other movement; studies to find out if regeneration of damaged cells is possible; and clinical trials designed to evaluate the effectiveness of certain drugs in stimulating the spinal cord. In one of these trials, Dr. Patricia Nance, a rehabilitation medicine specialist, has found that the chemical baclofen can eliminate some of the abnormal movements seen in patients with spinal cord injury. The experimental cardiology program headed by Dr. Naranjan Dhalla at the St. Boniface General Hospital Research Centre is another flagship group that has seen its efforts pay off in terms of an MRC group grant. The team's goal is an ambitious one: to understand and prevent factors that cause coronary heart disease. Dr. Dhalla emphasizes the multidisciplinary nature of the program and the benefits of looking at problems using several different approaches. He has stated that two main thrusts govern the direction of the research. First, group members are seeking to understand how heart cells are damaged by loss of blood flow and, more specifically, the roles high blood pressure and cholesterol play in priming the heart and arteries for ischemic damage. Second, they are studying the impact of congestive heart failure on the heart and how such changes might be prevented. Already, the group has played a major role in the development of calcium entry blockers to correct calcium overload in the heart due to membrane damage, and they were the first to show the antioxidant effects of Vitamin E.
Healing the heart: Dr. Naranjan Dhalla heads the experimental cardiology program that won $5.2 million in support from the Medical Research Council. 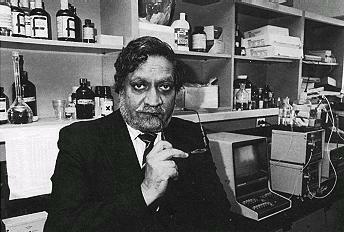 The awarding of a new group grant on "Biology of Sexually Transmitted Infections" was announced in October 1995. (See related article on page 25) This research team is headed by Dr. Francis Plummer from the Department of Medical Microbiology and involves not only Manitoba researchers but others at the University of Toronto, McMaster University and the University of Nairobi. Their research has already had a major impact on our knowledge of sexually transmitted diseases, especially the heterosexual transmission of HIV, and the program is considered a model of collaborative international research. Only two years before Dr. Joanne Embree started her research on perinatal AIDS, the possibility that children could get HIV was generally unrecognized. Focusing on one of the team's projects shows, however, that the research stakes can be high and that knowledge gained, no matter how scientifically valid, can lead to significant dilemmas. Dr. Joanne Embree's special interest is perinatal HIV transmission. Contrary to preconceived ideas about an almost universal transmission rate from mother to child and early onset of AIDS in children of infected mothers, she has shown that only 40% of such infants are HIV positive and of these only 10-20% develop AIDS in the first year of life. Dr. Embree found that an important factor in transmission was prolonged breastfeeding. Unfortunately, there are few alternatives in third-world countries where access to cheap infant formula and unpolluted water is limited and where, for many women, prolonged breastfeeding may be an important method of family planning. Dr. Embree and her collaborators are developing models to test how modified patterns of breastfeeding might affect transmission rates of HIV, infant nutrition and mortality, and maternal health and fertility. AIDS is obviously an area where researchers are acutely aware of the bleak future faced by many of their human subjects. However, the team has been touched by death in an even more personal way. A recent accident in Kenya took the lives of several people involved with the program, including local physicians and a student, a sober reminder that the joy and satisfaction of doing research may be accompanied by very real adversity, as well as the occasional disappointment and discouragement faced by many. In the programs referred to above, both biomedical and more clinically oriented projects play important and complementary roles. Since "health" research has long been another of our strengths, many local researchers were encouraged by MRC's broadening of its mandate to include population health and social and behaviourial determinants of health and research into health services outcomes. Drs. Leslie and NoraLou Roos at the Manitoba Centre for Health Policy and Evaluation will continue to lead projects on population-based measures for health policy and planning as part of a new National Network of Centres of Excellence - the "Health Research Network." Dr. Patricia Kaufert of the Department of Community Health Sciences has also been funded through one of the new MRC committees for her project: "The use of health care services by women living in the province of Manitoba." Obviously, further integration of the expertise of epidemiologists, sociologists, medical anthropologists and related specialists into our more biomedically based research teams could have mutually beneficial results. Although the programs I have mentioned are based in the Faculty of Medicine, our strategic planning process is committed to fostering development of health research in other faculties and collaborations both within the university community and with outside partners, including industry. One endeavour that clearly demonstrates our potential in this area has been the establishment of the Manitoba Antibiotic Research Laboratory under the directorship of Dr. George Zhanel. Dr. George Zhanel is head of the Manitoba Antibiotic Research Laboratory. Involving researchers in the Faculty of Pharmacy and the Faculty of Medicine, the focus of the laboratory is twofold: the development of new antibiotics through the identification of mechanisms of bacterial resistance, and pharmacodynamics by which approved drugs are used in new combinations to fight infections. Dr. Zhanel credits the laboratory's success to its close collaboration with pharmaceutical companies and non-industry partners. One project on therapy for fungal infections receives support from MRC and from Lilly and Bristol-Myers Squibb, while another, funded by the Children's Hospital Research Foundation, is seeking effective treatment for penicillin-resistant streptococcal infections. In addition, Merck Frosst has funded a chair in pharmaceutical microbiology, and Lilly provided support for the first postdoctoral fellowship in pharmacodynamics to be established worldwide. The success of these programs is due in large part to the people involved in them. In these days of fiscal restraint and cut-backs, people will continue to be the University's most valuable resource. We need to guide and encourage our trainees and provide meaningful career opportunities for faculty and research support staff. It was very gratifying that eight Manitoba researchers ranked highly enough in the March 1995 competition to qualify for studentship vouchers, a number surpassed only by McGill University, the University of Toronto and Université de Montréal. In addition, we were pleased to host the pilot program for the Jobs Creation Initiative, funded by MRC and Human Resources Development Canada. Most of the trainees from that pilot program have found employment in research or have gone on postgraduate training, and its success has led to the establishment of similar programs across the country. Finally, I would like to end this update from the University of Manitoba with the announcement of the latest "recruit" to our health research community. Dr. Emöke Szathmáry will take up her position as president of the university on July 1, 1996. An eminent administrator and health researcher, Dr. Szathmáry is well known for her work on population genetics and susceptibility to diabetes in Dogrib populations. We wish her well and look forward to her academic leadership in these challenging times; there is little doubt that the winds of change will continue to blow well into the 21st century. MRC Communiqué, Winter/Spring 1996, pp. 18-21. Copyright © 1996, Medical Research Council of Canada.